Learn about canine lymphoma from BluePearl specialists. Lymphoma is one of the most common types of cancer diagnosed in dogs. It develops from specific cells of the immune system, called lymphocytes, that circulate through the blood. For that reason, lymphoma is generally considered a systemic disease (rather than a local one) and needs to be treated with systemic therapy. Lymphoma can affect many different organs. In over half of the dogs with this diagnosis, lymphoma will be present in their peripheral lymph nodes. Less commonly, it will occur in the chest cavity, intestines, skin or other organs. Symptoms vary depending on what organ is affected. For most dogs, lymphoma is not a painful cancer. 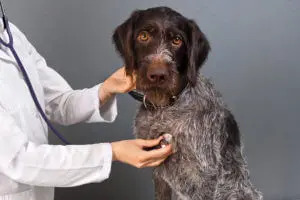 In fact, many dogs with lymphoma are taken to their veterinarian because the owner feels lumps under the skin in the area of the lymph nodes (under the chin, in front of the shoulders or behind the knees). Some dogs will have other non-specific signs such as decreased appetite, vomiting or a sluggish activity level. Dogs with intestinal lymphoma generally experience vomiting and/or diarrhea and weight loss. Lymphoma in the chest cavity may cause a cough or intolerance of exercise, and lymphoma of the skin can occur as single or multiple nodules. Some dogs with lymphoma will have increased thirst and increased urination because of an elevated blood calcium level. In most dogs, the lymph nodes are enlarged, and the diagnosis can be made with a needle aspiration of those nodes. This procedure is performed while the patient is awake using a needle similar to the size used for vaccinations. 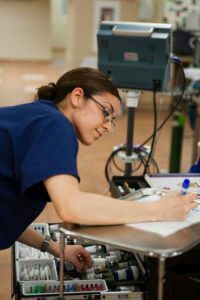 At BluePearl Veterinary Partners, the oncology service can often evaluate a sample and determine a diagnosis at the initial appointment. In some cases, the sample will be sent to a lab for confirmation or special testing. In still other cases, a biopsy of the lymph node must be obtained. A lymph node biopsy provides the oncologist with more information about that patient’s lymphoma (histologic type and T-cell vs. B-cell), which sometimes affects prognosis. In many cases, this additional information is not going to change the treatment options; therefore, a biopsy is not required to start therapy. Situations in which a biopsy is often necessary include intestinal and skin lymphomas. Lymphoma of the chest can often be diagnosed by needle aspiration generally completed with the help of ultrasound. Clinical staging involves completing a set of diagnostic tests to determine where the lymphoma is located and if it has spread from its initial site. These tests can include any of the following: routine blood work, chest X-rays, abdominal ultrasound and bone marrow aspiration. Lymphoma is a disease that can be wonderfully responsive to treatment, but for veterinary patients, it is not cured. In most cases, chemotherapy is the recommended treatment. Without treatment, the average lifespan of a dog with lymphoma is very short, usually 1-2 months. However, with treatment, about 85% of dogs with lymph node involvement will go into remission to the point that lymphoma can no longer be detected in the lymph nodes. 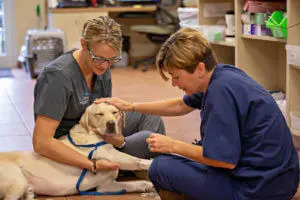 Because dogs tolerate chemotherapy much better than people do, the doses of medication used are much lower than those used in people, which helps to ensure the oncologist achieves the goal of maintaining an excellent quality of life for the patient throughout treatment. There are many chemotherapy drugs that are effective in the treatment of lymphoma. The protocol choice is influenced by many things: specific patient factors (age, how sick are they, concurrent medical problems), cost, type of lymphoma and ease of treatment administration. Combination chemotherapy protocols that utilize more than one drug at a time are the most successful in fighting the cancer. The BluePearl oncology service commonly uses a University of Wisconsin combination protocol because of its widely reported, long lasting success. This protocol involves weekly treatments for two months, then every other week treatments for an additional four months. Of course, there may be instances when the oncologist will select a different protocol. Chemotherapy protocols that use only one drug can also be used, but the average length of remission is generally shorter. The advantage of a single agent protocol is that it requires fewer visits to the clinic and may be more affordable. For owners that choose not to pursue chemotherapy, prednisone is an inexpensive oral steroid that can achieve a short remission (1-2 months) in some dogs. 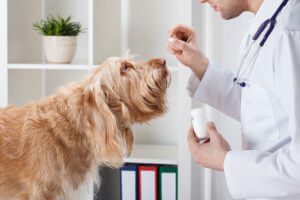 This drug has the potential to make dogs resistant to chemotherapy; consequently, it should only be started once the decision has been made to not treat with chemotherapy. The cost of treatment is determined by the chemotherapy drug(s) selected and how they are administered. Because of the wide variety of medications available to treat lymphoma, during your evaluation at BluePearl, the oncologist will have an extensive discussion with you about your pet and the protocol options. At that time, you will be provided with the estimated costs for treatment. The treatment goal is to maintain your pet’s quality of life, while ensuring you have as much time with your pet as possible.